Rigveda, hymns that were composed chiefly during the last two or three centuries of the 2nd millennium BCE can be termed as the earliest literary source for the history of Hinduism . The religious life reflected in this text shows Hinduism as an earlier sacrificial religious system, referred to as Brahmanism or Vedism, which developed in India among Indo-European-speaking peoples. Scholars from the period of British colonial rule postulated that this branch of a related group of nomadic and seminomadic tribal peoples, originally inhabiting the country of southern Russia and Central Asia, brought with them the Sanskrit language. These scholars further holds that other branches of these peoples penetrated into Europe, bringing with them the Indo-European languages that developed into the chief language. It is the ancient tongue, which Sir William Jones pronounced “more perfect than the Greek, more copious than the Latin, and more exquisitely refined than either,” should have been the spoken language of the Aryans . It was a near relative of the early Persian dialect in which the Avesta was composed. The Sanskrit of the Vedas and the epics has already the earmarks of a classic and literary tongue, used only by scholars and priests; the very word Sanskrit means “prepared, pure, perfect, sacred.” The language of the people in the Vedic age was not one but many; each tribe had its own Aryan dialect. India has never had one language. The Vedas contain no hint that writing was known to their authors. It was not until the eighth or ninth century B.C. that Hindu probably Dravidian merchants brought from western Asia a Semitic script, akin to the Phoenician; and from this “Brahma script,” as it came to be called, all the later alphabets of India were derived.” For centuries writing seems to have been confined to commercial and administrative purposes, with little thought of using it for literature; “merchants, not priests, developed this basic art.” ( Perhaps poetry will recover its ancient hold upon our people when it is again recited rather than silently read.) Even the Buddhist canon does not appear to have been written down before the third century B.C. The oldest inscriptions in India are those of Ashoka.” We who (until the air about us was filled with words and music) were for centuries made eye-minded by writing and print, find it hard to understand how contentedly India, long after she had learned to write, clung to the old ways of transmitting history and literature by recitation and memory. The Vedas and the epics were songs that grew with the generations of those that recited them; they were intended not for sight but for sound. The language of the Indo-Aryans should be of special interest to us, for Sanskrit is one of the oldest in that “Indo-European” group of languages to which our own speech belongs. When a language is spoken by unqualified people the pronunciation of the word changes to some extent; and when these words travel by word of mouth to another region of the land, with the gap of some generations, it permanently changes its form and shape to some extent. We feel for a moment a strange sense of cultural continuity across great stretches of time and space when we observe the similarity in Sanskrit, Greek, Latin and English of the numerals, the family terms, and those insinuating little words that, by some oversight of the moralists, have been called the copulative verb. Cf. English one, two, three, four, five with Sanskrit ek, dwee, tree, chatoor, panch;Latin unus, duo, tres, quattuor, quinque; Greek heis, duo, tria, tettara, pente. (Quattuorbecomes four, as Latin quercus becomes fir.) Or cf. English am, art, is with Sanskrit asmi, asi, asti; Latin sum, es, est; C -eek eimi, ei, esti. An element common to most of the Indo-European groups. An element held in common with the early Iranians. An element appearing only in the Indian subcontinent. 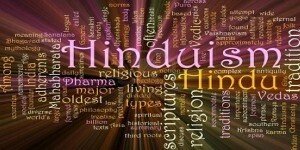 Hinduism arose from multiple sources and from the geniuses of individual reformers in all periods. Present-day Hinduism contains few direct survivals from its Indo-European heritage. Some of the elements of the Hindu wedding ceremony, notably the circumambulation of the sacred fire and the cult of the domestic fire itself, are rooted in the remote Indo-European past. The same is probably true of some aspects of the ancestor cult. The Rigveda contains many other Indo-European elements, such as ritual sacrifices and the worship of male sky gods, including the old sky god Dyaus, whose name is cognate with those of Zeus of ancient Greece and Jupiter of Rome (“Father Jove”). The Vedic heaven, the “world of the fathers,” resembles the Germanic Valhalla and seems also to be an Indo-European inheritance. The Indo-Iranian element in later Hinduism is chiefly found in the ceremony of initiation, or “second birth” (upanayana), a rite also found in Zoroastrianism. Performed by boys of the three “twice-born” upper classes, it involves the tying of a sacred cord. Another example of the common Indo-Iranian heritage is the Vedic god Varuna. Although now an unimportant sea god, Varuna, as portrayed in the Rigveda, possesses many features of the Zoroastrian supreme deity Ahura Mazdā (“Wise Lord”). A third example can be seen in the sacred drink soma, which corresponds to the sacred haoma of Zoroastrianism. Even in the earlier parts of the Rigveda, however, the religion displays numerous Indian features that are not evident in Indo-Iranian traditions. Some of these features may have evolved entirely within the Vedic framework, it is generally presumed that many of them stem from the influence of inhabitants of the Indian subcontinent who had no connection with Indo-European peoples. For example, some scholars attribute non-Vedic features of Hinduism to a people who are often vaguely and incorrectly called “Dravidian,” a term that refers to a family of languages and not an ethnic group. Some scholars have further argued that the ruling classes of the Indus civilization, also called the Harappa culture (c. 2500–1700 BCE), spoke a Dravidian language and have tentatively identified their script with that of a Dravidian language. The development of Hinduism can be interpreted as a constant interaction between the religion of the upper social groups, represented by the Brahmans, and the religion of other groups. From the time of the Vedas (c. 1500 BCE), people from many strata of society throughout the subcontinent tended to adapt their religious and social life to Brahmanic norms. This development resulted from the desire of lower-class groups to rise on the social ladder by adopting the ways and beliefs of the higher castes. Further, many local deities were identified with the gods and goddesses of the Puranas. The process, sometimes called “Sanskritization,” began in Vedic times and was probably the principal method by which the Hinduism of the Sanskrit texts spread through the subcontinent and into Southeast Asia. Sanskritization still continues in the form of the conversion of tribal groups, and it is reflected in the persistence of the tendency among some Hindus to identify rural and local deities with the gods of the Sanskrit texts. Sanskritization also refers to the process by which some Hindus try to raise their status by adopting high-caste customs, such as wearing the sacred cord and becoming vegetarians. If Sanskritization has been the main means of connecting the various local traditions throughout the subcontinent, the converse process, which has no convenient label, has been one of the means whereby Hinduism has changed and developed over the centuries. Many features of Hindu mythology and several popular gods—such as Ganesha, an elephant-headed god, and Hanuman, the monkey god—were incorporated into Hinduism and assimilated into the appropriate Vedic gods by this means. Similarly, the worship of many goddesses who are now regarded as the consorts of the great male Hindu gods, as well as the worship of individual unmarried goddesses, may have arisen from the worship of non-Vedic local goddesses. The prehistoric culture of the Indus valley arose in the latter centuries of the 3rd millennium BCE from the metal-using village cultures of the region. There is considerable evidence of the material life of the Indus people, but its interpretation remains a matter of speculation until their writing is deciphered. Enough evidence exists, however, to show that several features of later Hinduism may have had prehistoric origins. In most of the village cultures, small terra-cotta figurines of women, found in large quantities, have been interpreted as icons of a fertility deity whose cult was widespread in the Mediterranean area and in western Asia from Neolithic times (c. 5000 BCE) onward. This hypothesis is strengthened by the fact that the goddess was apparently associated with the bull—a feature also found in the ancient religions farther west. Sindhu is divine. In the beginning was the word. The first recorded word was the Veda. The earliest mention of this great river is in the Vedas. The Sindhu — the cradle of Indian civilization — finds its most dramatic description in the Rig Veda (c. 1500 BC). “Sindhu in might surpasses all streams that flow. His roar is lifted up to heaven above the earth; he puts forth endless vigour with a flash of light ….Even as cows with milk rush to their calves, so other rivers roar into the Sindhu. As a warrior king leads other warriors, so does Sindhu leads other rivers… Rich in good steeds is Sindhu, rich in gold, nobly fashioned, rich in ample wealth”. Sindhu is too alive and too divine to be “it”, and so Sindhu is “he”! When the Vedic seer invokes the Sindhu. The Veda refers to the Ganga only twice, but it makes as many as thirty references to the Sindhu! It is the oldest name in Indian history – and in Indian geography. This is the great Sindhu that gave Sindh and Hind — its name. The Rig Veda compares the sound of the flowing Sindhu to the roar of thunderstorm, indicating the sense of awe inspired by the river in the minds of Aryans. Later on, in the Vedic period, the word Sindhu came to denote the sea, from which the vastness of the river can be gauged. In the Ramayana, Sindhu is seen to be given the title “Mahanadi”, which means “the mighty river”. Kalidasa says in the Raghuvansha that on the advice of his maternal uncle Yudhajat, Rama conferred Sindh on Bharata. Rama’s ancestor Raghu’s triumphant horses had relaxed on the bank of the Sindhu. Sindh was part of Dasaratha’s empire. When Kekayi goes into a sulk, Dasaratha tells her, “The sun does not set on my empire. Sindh, Sauvira, Saurashtra, Anga, vanga, Magadha, Kashi, Koshal — they are all mine”. When Sita was kidnapped by Ravana, Rama sent the vanaras (monkeys) to look for her, among other places, in Sindh with its “remarkable swimming horses”. In the Mahabharat, the Sindhu is reverentially mentioned along with other two holy rivers, the Ganga and Saraswati. References to the Sindhu are also seen in many ancient literary works like those of Kalidasa, Bana, Panini. The fame of the mighty Sindhu had spread even beyond the subcontinent and it found reflections in the literary works of the Greek and Roman empires. It finds mention in some of the earlier literature of India. Another great Sanskrit poet, Bhasa, had done a whole play, “Avimark” on the romance of Prince Avimark with Princess Kurangadi of Sindhu-Sauvira. The Bhavishya Purana says that Shalivahana, the grandson of Maharaja Vikramaditya of Ujjain, established law and order in ‘Sindhusthan” and fixed his frontier on the Sindhu. Anshnath, the eleventh Jain Tirthankar, was a Sindhi. He died in Bengal. The Jaina Dakshinya Chihna (eight century) speaks of Sindhis as “elegant, with a lovely, soft and slow gait. They are fond of songs, music and dance and feel affection for their country”. There is a legend that the great Buddha had graced Sindh with his visit. Finding the climate extreme, and the area dry and dusty, he had permitted the bhikshus to wear shoes here. He had also permitted the use of padded clothing, forbidden elsewhere. Here Sthavirtis, the Prince of Rorik or Roruka (Aror or Alor, near modern Rohri) became his disciple. When the Buddha went round his native Kapilavastu in a chariot, it was mentioned that the “four auspicious horses, of lotus colour, had come from Sindhudesh”. To this day, historic Buddhist stupas are found in Sindh. The Divyavadana (Tibetan version) reports: “The Buddha is in Rajgriha. At this time, there were two great cities in Jampudvip (north India), Pataliputra and Roruka. When Roruka rises, Pataliputra declines; when Pataliputra rises, Roruka declines”. Here was Roruka of Sindh competing with the capital of the Magadha empire. When Bimbisar was the king of the Magadha, he sent Rudrayan, king of Sindhu-Sauvita, a rare portrait of the Buddha. The two powerful ministers of Sindh at the time were Hiroo and Bheru, their names still common amongst the Sindhis! Chandragupta Maurya first won Sindh and then Punjab. It was from this base that he displaced the Nandas, occupied Pataliputra and established the great Mauryan empire. Kashmir’s ancient royal history Rajatirangini has many references to Sindh and the Sindhis. Kuya’s son Sindhu rose to lead the elephant brigade of Kashmir. He was advisor to Queen Dida. A top honour was “Sindhu Gaja”, Elephant of Sindh. Many seals show what may be religious and legendary themes such as seals depicting trees next to figures who may be divinities believed to reside in them. The bull is often depicted standing before a sort of altar, and the horned figure has been interpreted as a Hindu god Shiva. Small conical objects have been interpreted by some scholars as phallic emblems, though they may have been pieces used in board games. Other interpretations of the remains of the Harappa culture are even more speculative and, if accepted, would indicate that many features of later Hinduism were already in existence 4,000 years ago. Some elements of the religious life of current and past folk religions—notably sacred animals, sacred plants (especially the pipal, Ficus religiose and Tulsa, Ocimum basilicum ), and the use of small figurines for worship—are found in all parts of India and have been borrowed from pre-Vedic civilizations. The people of the early Vedic period left few material remains, and leave a very important literary record called the Rigveda. Its 1,028 hymns are distributed throughout 10 books. A hymn usually consists of three sections: an exhortation; a main part comprising praise of the deity, prayers, and petition, with frequent references to the deity’s mythology; and a specific request. The Rigveda is not a unitary work, and its composition may have taken several centuries. In its form at the time of its final edition, it reflected a well-developed religious system. The date commonly given for the final recension of the Rigveda is 1200 BCE. During the next two or three centuries it was supplemented by three other Vedas and still later by Vedic texts called the Brahmanas and the Upanishads . The Buddhists and Jains had made use of artificial caves for religious purposes, and these were adapted by the Hindus. Hindu cave shrines, however, are comparatively rare, and none have been discovered from earlier than the Gupta period. The Udayagiri complex has cave shrines, but some of the best examples are in Badami (c. 570), the capital of the Chalukya dynasty in the 6th century. The Badami caves contain several carvings of Vishnu, Shiva, and Harihara (an amalgamation of Vishnu and Shiva), as well as depictions of stories connected with Vishnu’s incarnation, Krishna. Near the Badami caves are the sites of Aihole and Pattadakal, which contain some of the oldest temples in the south; some temples in Aihole, for example, date to approximately 450. For this reason these sites are sometimes referred to as the “laboratory” of Hindu temples. Pattadakal, another capital of the Chalukya empire, was a major site of temple building by Chalukyan monarchs in the 7th and 8th centuries. These temples incorporated styles that eventually became distinctive of north and south Indian architecture. The Gupta period was marked by the rapid development of temple architecture. Earlier temples were made of wood, but freestanding stone and brick temples soon appeared in many parts of India. By the 7th century, stone temples, some of considerable dimensions, were found in many parts of the country. Originally, the design of the Hindu temples may have borrowed from the Buddhist precedent, for in some of the oldest temples the image was placed in the centre of the shrine, which was surrounded by an ambulatory path resembling the path around a stupa (a religious building containing a Buddhist relic). Nearly all surviving Gupta temples are comparatively small; they consist of a small cella (central chamber), constructed of thick and solid masonry, with a veranda either at the entrance or on all sides of the building. The earliest Gupta temples, such as the Buddhist temples at Sanchi, have flat roofs; however, the sikhara (spire), typical of the north Indian temple, was developed in this period and with time was steadily made taller. Tamil literature mentions several temples. The epic Silappatikaram (c. 3rd–4th centuries), for instance, refers to the temples of Srirangam, near Tiruchchirappalli, and of Tirumala-Tirupati (known locally as Tiruvenkatam). In the Pallava site of Mahabalipuram (Mamallapuram), south of Chennai, a number of small temples were carved in the 7th century from outcroppings of rock; they represent some of the best-known religious buildings in the Tamil country. Mamallapuram and Kanchipuram, near Chennai in the state of Tamil Nadu, were major cities in the Pallava empire (4th–9th centuries). Kanchipuram, the Pallava capital, is sometimes called the “city of a thousand temples.” Some of its temples date to the 5th century, and many feature magnificent architecture. Dedicated to local manifestations of Shiva, Vishnu, and various forms of the Great Goddess, the temples were patronized by royalty and aristocrats but also received donations and endowments from the larger population. Evidence for contact between the Pallava empire and Southeast Asia is provided by some of the earliest inscriptions (c. 6th–7th centuries) of the Khmer empire, which are written in “Pallava style” characters. There are also several visual connections between temple styles in India and in Southeast Asia, including similarities in architecture (e.g., the design of temple towers) and iconography (e.g., the depiction of Hindu deities, epic narratives, and dancers in carvings on temple walls). Yet there are also differences between them. For example, the Cambodian Shiva temples in Phnom Bakheng, Bakong, and Koh Ker resemble mountain pyramids in the architectural idiom of Hindu and Buddhist temples in Borobudur and Prambanan on the island of Java in present-day Indonesia. The period between the fall of the Mauryan empire (c. 185 BCE) and the rise of the Gupta dynasty (c. 320 CE) was one of great change, including the conquest of most parts of western India by a succession of invaders. India was opened to influence from the West as never before, not only by invaders but also through flourishing maritime trade with the Roman Empire. The effects of the new contacts were most obvious in art and architecture. One of the oldest freestanding stone temples in the subcontinent has been excavated at Taxila, near Rawalpindi, Pak. During the 1st century BCE the Gandharaschool of sculpture arose in the same region and made use of Hellenistic and Roman prototypes, mainly in the service of Buddhism. Hindu temples of the period probably were made of wood, because no remains of them have survived; however, literary evidence shows that they must have existed. Indian religious life underwent great changes during the period 550–450 BCE. There were many heterodox teachers who organized bands of ascetic followers, and each group adopted a specific code of conduct. They gained considerable support from ruling families and merchants. The latter were growing in wealth and influence, and many of them were searching for alternative forms of religious activity that would give them a more significant role than did orthodox Brahmanism or that would be less expensive to support. The scriptures of the new religious movements throw some light on the popular religious life of the period. The god Prajapati was widely believed to be the highest god and the creator of the universe; Indra, known chiefly as Shakra (“The Mighty One”), was second to him in importance. The Brahmans were very influential, but there was opposition to their large-scale animal sacrifices—on moral, philosophical, and economic grounds—and to their pretensions to superiority by virtue of their birth. The doctrine of transmigration was by then generally accepted, though a group of outright materialists—the Charvakas, or Lokayatas—denied the survival of the soul after death. The ancestor cult, part of the Indo-European heritage, was retained almost universally, at least by the higher castes. Popular religious life largely centred around the worship of local fertility divinities (yakshas), cobra spirits (nagas), and other minor spirits in sacred places such as groves. Although these sacred places were the main centres of popular religious life, there is no evidence of any buildings or images associated with them, and it appears that neither temples nor large icons existed at the time. About 500 BCE asceticism became widespread, and increasing numbers of intelligent young men “gave up the world” to search for release from transmigration by achieving a state of psychic security. This century was marked by the rise of breakaway sects of ascetics who rejected traditional religion, denying the authority of the Vedas and of the Brahmans and following teachers who claimed to have discovered the secret of obtaining release from transmigration. By far the most important of these figures were Siddhartha Gautama, called the Buddha, and Vardhamana, called Mahavira (“Great Hero”), the founder of Jainism. The orthodox Brahmanical teachers reacted to these tendencies by devising the doctrine of the four ashramas, which divided the life of the twice-born after initiation into four stages: the brahmacharin(celibate religious student); the grihastha (married householder); the vanaprastha (forest dweller); and the sannyasin (wandering ascetic). This attempt to keep asceticism in check by confining it to men of late middle age was not wholly successful. Thereafter Hindu social theory centred on the concept of varnashrama dharma, or the duties of the four classes (varnas) and the four ashramas, which constituted the ideal that Hindus were encouraged to follow. The first great empire of India, the Mauryan empire, arose in the 3rd century BCE. Its early rulers were non-Brahmanic; Ashoka (reigned c.265–238 BCE), the third and most famous of the Mauryan emperors, was a professed Buddhist. Although there is no doubt that Ashoka’s patronage of Buddhism did much to spread that religion, his inscriptions recognize the Brahmans as worthy of respect. Sentimentsin favour of nonviolence (ahimsa) and vegetarianism, much encouraged by the non-Brahmanic sects, spread during the Mauryan period and were greatly encouraged by Ashoka. A Brahmanic revival appears to have occurred with the fall of the Mauryas ( in Shung Dynesty). The orthodox religion itself, however, was undergoing change at this time, as theistic tendencies developed around the gods Vishnu and Shiva. The centuries were marked by the recension of the two great Sanskrit epics, the Ramayana and the Mahabharata (the latter incorporating into it the Bhagavadgita). The worship of Vishnu, incarnate as Rama in the Ramayana, and Krishna in the Mahabharata developed significantly during this period , as did the cult of Shiva, who plays an active role in the Ramayana and Mahabharata. The Vedic god Rudra gained importance from the end of the Rigvedic period. In the Svetashvatara Upanishad, Rudra is for the first time called Shiva and is described as the creator, preserver, and destroyer of the universe. His followers are called on to worship him with devotion (bhakti). The tendency for the laity to form themselves into religious guilds or societies—evident in the case of the yaksha cults, Buddhism, and Jainism—promoted the growth of devotional Vaishnavism and Shaivism. These local associations of worshipers appear to have been a principal factor in the spread of the new cults. Theistic ascetics are less in evidence at this time, though a community of Shaivite monks, the Pashupatas, existed by the 2nd or 3rd century CE. By the time of the early Gupta empire the new theism had been harmonized with the old Vedic religion, and two of the main branches of Hinduism were fully recognized. The Vaishnavas had the support of the Gupta emperors, who took the title paramabhagavata (“supreme devotee of Vishnu”). Vishnu temples were numerous, and the doctrine of Vishnu’s avatars (incarnations) was widely accepted. Of the 10 incarnations of later Vaishnavism, however, only two seem to have been much worshipped in the Gupta period (4th–6th century). These were Krishna, the hero of the Mahabharata, who also begins to appear in his pastoral aspect as the cowherd and flute player, and Varaha, the divine boar, of whom several impressive images survive from the Gupta period. A spectacular carving in Udayagiri (Madhya Pradesh) dating from about 400 CE depicts Varaha rescuing the earth goddess, Vasudha. Temples in Udayagiri (c. 400) and Deogarh (c. 500) also portray Vishnu reclining on the serpent Ananta (“Without End”). Shaivism theology ranges from Shiva being the creator, preserver, destroyer to being the same as the Atman (self, soul) within oneself and every living being. It is closely related to Shaktism, and some Shaiva worship in Shiva and Shakti temples. Shaktism (Sanskrit: Śāktaḥ, lit., “doctrine of energy, power, the Goddess”) is a major tradition of Hinduism, wherein the metaphysical reality is considered feminine and Parvati (goddess) is supreme. The Shaivites were also a growing force in the religious life of India. The sect of Pashupata ascetics, founded by Lakulisha (or Nahulisha), who lived in the 2nd century CE, is attested by inscriptions from the 5th century; it is among the earliest of the sectarian religious orders of Hinduism. Representations of the son of Shiva, Skanda (also called Karttikeya, the war god), appeared as early as 100 BCE on coins from the Kushan dynasty, which ruled northern India, Afghanistan, and Central Asia in the first three centuries of the Common Era. Shiva’s other son, the elephant-headed Ganesha, patron deity of commercial and literary enterprises, did not appear until the 5th century. Very important in this period was Surya, the sun god, in whose honour temples were built, though in modern times he is little regarded by most Hindus. The solar cult had Vedic roots but later may have expanded under Iranian influence. Several goddesses gained importance in this period. Although goddesses had always been worshipped in local and popular cults, they play comparatively minor roles in Vedic religion. Lakshmi, or Shri, goddess of fortune and consort of Vishnu, was worshipped before the beginning of the Common Era, and several lesser goddesses are attested from the Gupta period. But the cult of Durga, the consort of Shiva, began to gain importance only in the 4th century, and the large-scale development of Shaktism (devotion to the active, creative principle personified as the mother goddess) did not take place until medieval times. Claims of early Hindu contacts farther east are no more doubtful. There is evidence of direct influence of Hinduism on China or Japan, which were primarily affected by Buddhism. The devotional cults further weakened Buddhism, which had long been on the decline. The philosophers Kumarila and Shankara were strongly opposed to Buddhism. In their journeys throughout India, their biographies claim, they vehemently debated with Buddhists and tried to persuade kings and other influential people to withdraw their support from Buddhist monasteries. Only in Bihar and Bengal, because of the patronage of the Pala dynasty and some lesser kings and chiefs, did Buddhist monasteries continue to flourish. Buddhism in eastern India, however, was well on the way to being absorbed into Hinduism when the Muslims invaded the Ganges valley in the 12th century. The great Buddhist shrine of Bodh Gaya, the site of the Buddha’s enlightenment, became a Hindu temple. At the end of its existence in India, Buddhism exhibited certain philosophical and cultural affinities with Hinduism. Among the Buddhist Tantrists appeared a new school of preachers, often known as Siddhas (“Those Who Have Achieved”), who sang their verses in the contemporary languages—early Maithili and Bengali. They taught that giving up the world was not necessary for release from transmigration and that one could achieve the highest state by living a life of simplicity in one’s own home. This system, known as Sahajayana (“Vehicle of the Natural” or “Easy Vehicle”), influenced both Bengali devotional Vaishnavism, which produced a sect called Vaishnava-Sahajiya with similar doctrines, and the Natha yogis (mentioned below), whose teachings influenced Kabir and other later bhaktimasters. The advent of Islam in the Ganges basin at the end of the 12th century resulted in the withdrawal of royal patronage from Hinduism in much of the area. The attitude of the Muslim rulers toward Hinduism varied. Some, like Fīrūz Tughluq (ruled 1351–88) and Aurangzeb (ruled 1658–1707), were strongly anti-Hindu and enforced payment of jizya, a poll tax on unbelievers. Others, like the Bengali sultan Ḥusayn Shah ʿAlāʾ al-Dīn (reigned 1493–1519) and the great Akbar (reigned 1556–1605), were well disposed toward their Hindu subjects. Many temples were destroyed by the more fanatical rulers, however. Conversion to Islam was more common in areas where Buddhism had once been strongest. By that time, most of the main divinities of later Hinduism were worshipped. Rama, the hero of the epic poem, had become the eighth avatar of Vishnu, and his popularity was growing, though it was not yet as prominent as it later became. Similarly, Rama’s monkey helper, Hanuman, now one of the most popular divinities of India and the most ready helper in time of need, was rising in importance. Krishnawas worshipped, though his consort, Radha, did not become popular until after the 12th century. Harihara, a combination of Vishnu and Shiva, and Ardhanarishvara, a synthesis of Shiva and his consort Shakti, also became popular deities.